Two rectangles are similar. The perimeter of the first rectangle is 36. The perimeter of the second is 12. If the base length of the second rectangle is 4, what is the height of the first rectangle? Solve for the height of the second rectangle. If they are similar, then the base and height are proportionally equal. A rectangle has a width of 2x. If the length is five more than 150% of the width, what is the perimeter of the rectangle? Given that w = 2x and l = 1.5w + 5, a substitution will show that l = 1.5(2x) + 5 = 3x + 5. 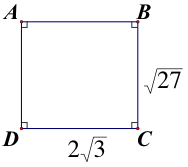 What is the perimeter of the below rectangle in simplest radical form? The perimeter of a figure is the sum of the lengths of all of its sides. The perimeter of this figure is √27 + 2√3 + √27 + 2√3. But, √27 = √9√3 = 3√3 . Now all of the sides have the same number underneath of the radical symbol (i.e. the same radicand) and so the coefficients of each radical can be added together. The result is that the perimeter is equal to 10√3. A rectangle has an area of 56 square feet, and a width of 4 feet. What is the perimeter, in feet, of the rectangle? Divide the area of the rectangle by the width in order to find the length of 14 feet. The perimeter is the sum of the side lengths, which in this case is 14 feet + 4 feet +14 feet + 4 feet, or 36 feet. The length of a rectangle is 3 more inches than its width. The area of the rectangle is 40 in2. What is the perimeter of the rectangle? Factor the quadratic equation and set each factor to 0 and solve. w2 + 3w – 40 = (w – 5)(w + 8) = 0 so w = 5 or w = -8. The only answer that makes sense is 5. You cannot have a negative value for a length. Therefore, w = 5 and l = 8, so P = 2l + 2w = 2(8) + 2(5) = 26 in. The length of a rectangle is and the width is . What is its perimeter? Perimeter of a quadrilateral is found by adding up the lengths of its sides. 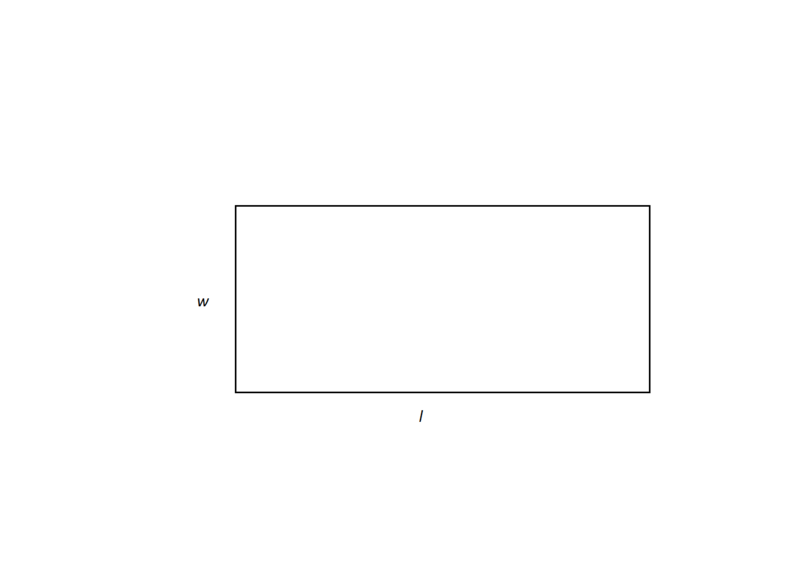 The formula for the perimeter of a rectangle is . Kayla took 25 minutes to walk around a rectangular city block. If the block's width is 1/4 the size of the length, how long would it take to walk along one length? Leaving the width to be x, the length is 4x. The total perimeter is 4x + 4x + x + x = 10x. We divide 25 by 10 to get 2.5, the time required to walk the width. Therefore the time required to walk the length is (4)(2.5) = 10. Robert is designing a rectangular garden. He wants the area of the garden to be 9 square meters. If the length of the lot is going to be three meters less than twice the width, what will the perimeter of the lot be in meters? Let l be the length of the garden and w be the width. By the specifications of the problem, l = 2w-3. w is either 3 or -3/2, but we can't have a negative width, so w = 3. If w = 3, then length = 2(3) - 3 = 3. A rectangular garden has an area of . Its length is meters longer than its width. How much fencing is needed to enclose the garden? We define the variables as and . We substitute these values into the equation for the area of a rectangle and get . Lengths cannot be negative, so the only correct answer is . If , then . 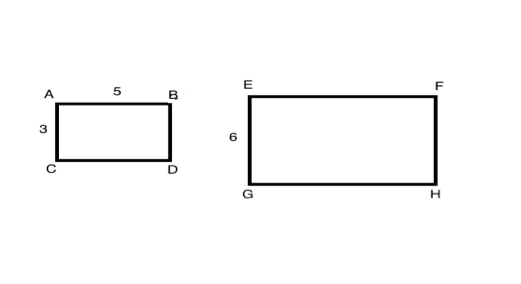 The two rectangles shown below are similar. What is the length of EF? When two polygons are similar, the lengths of their corresponding sides are proportional to each other. In this diagram, AC and EG are corresponding sides and AB and EF are corresponding sides. From this proportion, we know that side EF is equal to 10.